Managing Director Cecilia Conrad comments on the complementary approaches of two bold philanthropic collaborations that share common goals with 100&Change, our global competition for bold solutions to critical problems. Two bold philanthropic collaborations were launched last week. 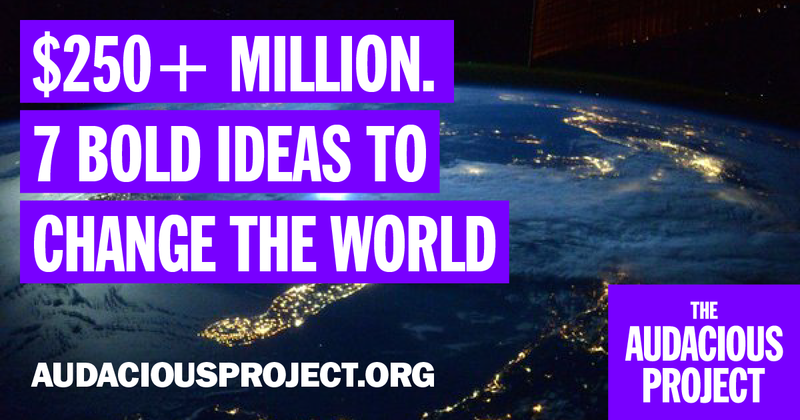 The Audacious Project, a coalition of nonprofit organizations, created a new model to inspire global change. The Rockefeller Foundation and the Chan Zuckerberg Initiative launched the Communities Thrive Challenge, a national challenge for community-driven solutions. Both initiatives share complementary approaches with 100&Change, our global competition for bold solutions to critical problems. We are excited to see more foundations join us by making philanthropic big bets and supporting solutions at scale. We are excited to see more foundations join us by making philanthropic big bets and supporting solutions at scale. Audacious and 100&Change share a common goal: to address significant social problems by increasing philanthropic support and connecting funders to powerful solutions. Each year up to five stand-out ideas will be researched and vetted before being publicly unveiled at the TED conference. Nominations will come from project's coalition of partners, as well as an open application process. As part of the "Audacious Coalition," MacArthur will contribute nominees and knowledge drawn from both the first and future iterations of 100&Change. During Audacious' pilot phase, 100&Change supplied nominees drawn from our rich database of submissions generated by our open call for proposals. We look forward to continuing to serve as conduit between teams with big ideas for solving the world's problems and sources of funding. Audacious provides another incentive for organizations to think bigger and bolder—to imagine "what if." We are pleased to note that three of the projects unveiled on Wednesday also submitted proposals to 100&Change. Our collaboration has the potential to increase the efficiency and efficacy of both initiatives as we seek to identify high-quality projects and match them with appropriate philanthropic resources. What Audacious gets especially right (that we wish we had considered earlier) is that they have engaged donors as part of the coalition, including them in the selection of the five projects. The projects presented at TED will benefit from the validation of peer donors, in addition to the due diligence conducted by staff and the Bridgespan Group, a global social impact advisory firm. 100&Change offers something different. We provide access to a large database of ideas that have been scored by our panel of esteemed judges and more in-depth introductions to the semi-finalists and finalists projects that have been vetted by external evaluators, technical reviewers, MacArthur's staff and Board of Directors. Both projects seek to make it easier for organizations with big ideas to put those projects in front of donors and for donors to benefit from due diligence that has already been done by others. …we will continue to look for opportunities to learn from and to partner with initiatives like The Audacious Project and the Communities Thrive Challenge to achieve our shared goals. 100&Change and the Communities Thrive Challenge also share a common goal: to connect ideas and problem solvers beyond our traditional networks with funding opportunities. The Communities Thrive Challenge is a $10 million funding opportunity open to organizations in the United States that are working to expand economic opportunity for low-income and financially insecure people and communities. Up to 10 grantees will each receive a $1 million grant and technical assistance. The challenge is open to both nonprofit and for-profit organizations not previously funded by either Rockefeller or Chan Zuckerberg. The two organizations also plan to expand their outreach by identifying organizations in small and mid-size cities and rural areas. 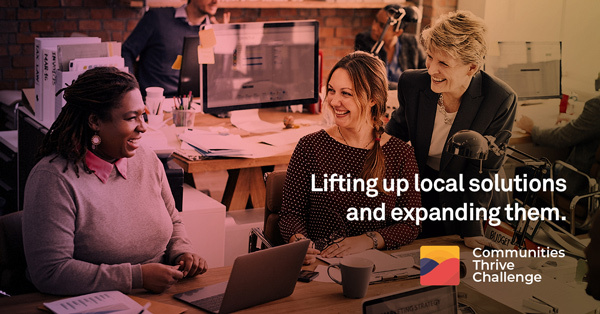 MacArthur has helped spread the word to the teams that proposed community-based projects and approaches to generating economic opportunity to 100&Change. I am also personally honored to be a member of the external panel of judges who will assist in vetting the proposals that they receive. What the Communities Thrive Challenge gets right is a need to target a specific category of change agents that might otherwise get overlooked. A limitation of a global competition like 100&Change was that local initiatives, especially those based in the United States, were at a disadvantage—in part because global solutions generally offer greater scale, across multiple locations, with potential beneficiaries in the millions—and because a dollar simply buys less in Detroit than in Damascus. 100&Change was also predicated on the fact that early funders supported projects at lower levels, providing the seed capital to test and develop ideas. Recipients of the $1 million Communities Thrive grants will not only be better situated to apply for traditional grant funding, but also more competitive in the next iteration of 100&Change. When we launched 100&Change, we hoped that it would spur a greater focus on problem-solving and inspire other philanthropists to make the very large investments required to make significant progress in achieving social change. Solutions are possible. The challenge is bringing those solutions to the attention of individuals and institutions with the philanthropic capital to make them happen. We see a need for a variety of tools to make that happen and, as we look to the next cycle of 100&Change, we will continue to look for opportunities to learn from and to partner with initiatives like The Audacious Project and the Communities Thrive Challenge to achieve our shared goals.